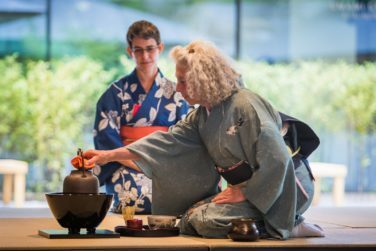 The Garden will offer a free public demonstration of Chado, the Way of Tea this Wednesday from 1:00-2:00pm in the Japanese Arts Learning Center. We are honored to partner with members of the Kashintei Kai Tea Society, who generously donate their time and knowledge to share this ancient and beautiful garden art form. The Way of Tea is intrinsically linked to Japanese gardens and understanding the kokoro (heart) of Japanese gardening.